Incredibly excited about this beautiful warm weather and sunshine. Spring is in the air! Безумно радуюсь нашей тёплой и солнечной погоде. Весна идёт, весне дорогу! 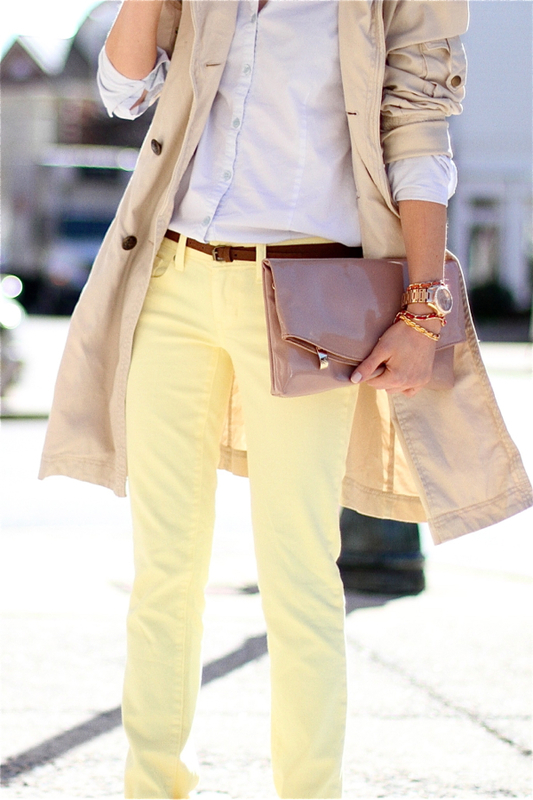 I really love yellow pants and coat!!!wow!!! the color is just pastel perfection! Wauw, I just love the color combination. this outfit is like breath of fresh air! i so love this! ah, these trousers...a dream!You look gorgeous! I simply love this look! your pastel skinnies are wonderful. I love this look, so chic & simple. Perfect color combination !!! Awesome outfit ! I love your pants ! Maybe I need to reconsider the yellow pants, I almost got some the other day but then I decided against it. But now that I see this outfit, I realized I need those pants! Love your outfit so much!! It's so Spring with those colors!! Truly beautiful! Love the neutral colors, simply perfect! A big THANK YOU to all of you, lovelies!!! This outfit is fab on you and I love the way you have styled your trench - tres chic. очень красивое сочетание по цвету-пастель и весна впереД! HEllo!! I'm Isa. I'm from Spaim. I love your style. Now, you have a new follower!!! Congratulations for your outfits!!! You wear pastels in such a sophisticated way! I'm so happy about spring too! Love your jacket, shoes, and bag. The mix of colors is sooo nice!!! what a cute outfit! i'm so in love with pastels at the moment too! can't wait for spring <3!